Take one of our great destination road trips, check out fun farmers markets and other family activities along the way, and plan your excursion! Feel the excitement build as you begin your venture into the Pennsylvania Wilds! Spotlighting is a unique opportunity that very few states allow. In the west, CO, WY etc. spotlighting is illegal and strictly forbidden, but not in PA. Spotlighting allows you to locate game that may only move nocturnally, and provides hours of recreational entertainment. This is a chance to locate a trophy game animal, for the small price of a spotlight and a little gas. Make sure you familiarize yourself with PA’s law on spotlighting which includes shining a light on any building, disturbing farm animals, spotlighting after 11 PM or during deer hunting season. We chose routes which take you on a combination of dirt, gravel and paved roads that are decorated with sights that will become part of your eternal memory. All roads are passable in a car, but clearances may be low and road maintenance will vary by season. Choose your vehicle wisely. Like all activities in the backwoods. backroads. backwaters. always put safety first. The road signs are often hard to read and run both parallel and horizontal to the roads. Be sure to review your trip ahead of time and don’t forget your camera, a Clearfield County map and a GPS if available. Visit Clearfield County’s GIS website http://www.clearfieldco.org/online-map-viewer/ for 3D maps of all the roads and landscape. This route is 30 miles and about 2 hours of driving time on roads that are narrow windy and vary between gravel/dirt and paved. Leave additional time to enjoy the extravagant scenery, have a bugle burger and experience the Elk Viewing Center. Start at the hotels in Clearfield (Exit 120 off I-80). Drive on 879 E along the West Branch Susquehanna River towards Frenchville. Make a left onto Knobs Road (T636). You will be on Knobs Road for a while and the road will turn into a dirt and gravel. Make a left on Caledonia Pike (T873/T464) follow the Caledonia Pike to Shagger’s Inn, a shallow water impound with nesting for osprey. Just past the lake make a right onto Shagger’s Inn Road. This is a narrow road that runs along a deep gorge. At the Y in the road go left on Medix Grade Road. (There is a waterfall about .10 of a mile at the right of the Y. It is on the left side of the road, you will see a turnaround area here) Medix Grade Road is not clearly marked at this intersection but will be marked as you drive along. You want to stay straight onto Medix Run Road. Next make a left onto the Quehanna Highway (2004). Make a right onto SR 555. Before the Benezette Store, turn left onto Winslow Hill and follow this road to Homestead Drive and the entrance for the Elk Viewing Center at 134 Homestead Drive. You can have dinner at the Benezette or Medix Hotel and sample some local wine at Benezette Wines. Note the Quehanna Highway is an alternative route that winds you past Marion Brooks Natural Area, an elk blind and Beaver Run. If you stay straight on 879 E the Quehanna Highway is straight at the Karthaus Intersection. Finish the directions onto SR 555. If you like scenic views this 1.5 hour/ 31 mile driving tour is perfect for you. Start at the DuBois Harley Davidson at 101 West DuBois Avenue, DuBois and turn left onto West DuBois Avenue. Make a left onto Main Street. You will be on Main Street past the historical Rumbarger Cemetery at the stop sign turn right onto Blinker Parkway (SR 119). Go straight through the light then veer left onto Stanley Road. After you cross the rail road tracks stay to the left the road will turn into Helvetia Road. At the SR 322/410 intersection go straight onto 322 then make a quick right .10 mile on to Golden Yoke Road. You will see St. Luke Church on the right, follow Golden Yoke Road and it will split stay to the left on Golden Yoke Road. This road is windy and narrow and will change to Schucker’s Orchard Road. At the Y continue straight onto Saddle Club Road. Follow Saddle Club Road for about 1 mile. Turn Right onto Cramer Road. This is a narrow gravel road at the stop sign turn right onto Irishtown Road which turns into Walltown Road. Turn right onto 219 S for a short time then make a left onto 6th street. At the stop sign turn right onto Bilger’s Rocks Road. Make a left into Bilger’s Rocks at the parking area. You have arrived at 1928 Bilger’s Rocks Road. NOTE: Route 410 is home to several Amish Shops. This route is not far off the path and would be a nice drive before heading to Bilger’s Rocks. This 27 mile/1.5 hr. adventurous driving route will wind you through country filled with tons of sights to see. You may want to pack a picnic lunch to enjoy at one of the attractions you will pass along this route. There are miles of fields to enjoy spotlighting. Most of the route is paved and should be ok for a car with slow travel. 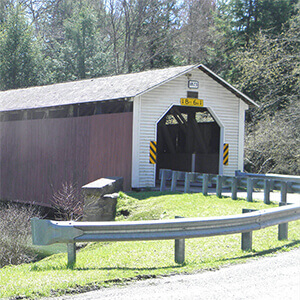 Start on Cover Bridge Road just off of SR 219 and follow the road through the McGees Mills Covered Bridge. Proceed straight at the stop sign onto Ridge Road. At the next stop sign turn left onto Town Road. At the split in the road stay straight onto La Jose Road. Across the rail road tracks veer to the right remaining on La Jose Road which turns into Cherry Corner Road then Irvona Road. At the cross roads make a hard left onto Ansonville Road. Stay straight on Ansonville Road you will cross SR 729. At the next stop sign make a left on Douglas Road toward New Millport. At the next Y turn right towards Curwensville then at the stop sign turn right on Condon/Zion Road. Take 453 South to the Bloody Knox Cabin, Kellytown, PA. This southern county driving tour is about an hour and 15 minutes or 19 miles. Start at 600 Lingle Road the home of the Osceola Mills Veterans Memorial and the Osceola Volunteer Library. Turn Left onto Curtain Street and proceed out of town. Veer to the right onto Bucket Line Road and at the stop sign make a left onto Scotch Hollow Road. When the road splits stay to the left on Scotch Hollow Road. At the stop sign turn right onto Coal Run Road for about 25 yards then make the first left onto Cowfer Road. This is a narrow dirt road that is about 2 miles long and takes you through the backwoods. Stay straight on Cowfer Road until you meet the paved road at the stop sign. Turn Left onto Parsonville Road (this road has many names Parsonville, Teutonic Ave. and Ashland Road). At Houtzdale, turn right onto Hannah Street. Make a left onto Kendrick Road (this street is not well marked on the left, if you see Pine Street you went too far). Stay straight at intersection onto Miriam Street (253S) past the Pipe and Pistol Restaurant. At stop sign go left continuing on Miriam Street. At the next stop sign go left on Union Street and the next stop sign go right onto Main Street (453S). This turns into Viola Pike. Veer right onto Walnut Street. At the stop sign go straight past the VFW and your destination will be on the left, you have arrived at 194 Walnut Street, Smithmill, PA Janesville Dam/Mountz Memorial Park. Mountz Memorial Park is a great facility with a playground and picnic facilities. Travel time without stops is 3 ½ hours. It is approximately 98 miles when Traveled as outlined. From Exit 120 of I-80 travel SR 879 West towards Curwensville. The route travels along sections of the Susquehanna River, with access points to parking at Rails to Trails (4.8 M and 7.6 M). Scenic views and photo opportunities abound along Rails to Trails. Just after the first stoplight and underpass in Curwensville, the Strawberry Tree will be on the left. They have a variety of gift items and local history information. At the second light, turn left. Proceed South on SR 453 1.1 M to Irvin Park. It’s a great break and photo opportunity, seated along the banks of the West Branch. Continuing south on SR 453, 1/2 M south will be a plaque for Curwensville Dam and a view of Curwensville Lake Recreation Area. Note: This is not the park entrance. Continue another 1.5 M and turn right on Lake Drive to go to the park. Turning left at that intersection will bring you to Bloomington Cemetery, which has many Civil War era headstones. CLRA has boating, picnicking, camping, scenic views, bird watching and wildlife viewing opportunities. Returning to SR 453, turn right, passing the Curwensville Dam Inn. After about 4 miles, farm and woodland views provide photo opportunities. Bloody Knox Historical Site and Museum is on the left as you enter Kellytown, and from there Madera is another 6.2 M, with the road winding along Clearfield Creek for much of the way. There are pull-offs at several points. Upon reaching the intersection with SR 53, turn right. (You may wish to take a detour to the left and see the Veterans Memorial and interesting old homes on some of the side streets). Turn left at the intersection of SR729 S in Glen Hope. Proceed 2.3 M to Hegarty’s Mansion. For more information about this historic site, call 814- 672-3355. During the holiday season, we recommend traveling 1 more mile on SR 729 S to see the animated light displays of K&F Wood Products and throughout Beccaria, and then returning to tour the Mansion. Otherwise, turn right at Hegarty’s Mansion and travel 0.8 M, where you will see a Christmas Tree farm and more panoramic views. At the next main intersection (2.5 M) go straight through. At the next intersection, turn right on Dillon Road. There are plenty of photographs waiting to be taken along this highway. Dillon Road T’s into SR53. Turn right and travel 1 M to Coalport’s Historic District. Turn right at the sign for the Coalport Coal Museum, and then left on Forest Street. The museum will be on the right. Continue on Forest Street until you come to the Veterans of Foreign Wars Post. Go straight through (you are again on SR 53N). After you pass Regal Mart and Clearfield Creek, you will be in Irvona. Turn left at the stop sign onto Rose St. Go 1.7 M and turn left on Black Elk Road. Gertie’s General Store will be at the intersection of Black Elk and Punkin Ridge Roads (3 M). Turn right. Some long-distance scenic views can be seen to your right just after Rabbit Hill. Travel one more mile and you will be entering some of the most beautiful woodlands in Appalachia. Reaching LaJose Road, turn left, then right at Cecil Hurd Highway (0.3 M). The historic LaJose Hotel will be on your left. Continue to Mahaffey (3.3M) Turn right at the intersection of US 36 and US 219 N.
There is a pull-off 0.3 M ahead with a view of the West Branch. Mahaffey Camp and more spectacular river views are another 0.6 M ahead. Camping is available at Chest Falls Campground (1.7 M). Continue on 219 N to Curry Run and Bells Landing (3.1M). Continue towards Grampian. Go straight at the Grampian light on SR 879E. Aletta’s Farm Market will be on the left (3.4M). Curwensville is less than 1 M ahead. At the first light, those enjoying wineries may turn left on Filbert Street and go to Bailey Road. Turn right and go to Starr Hill Winery; 1.1 M from the turn. 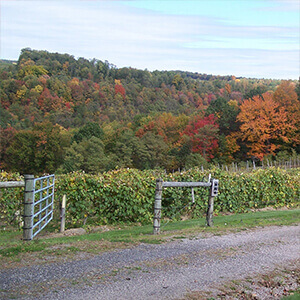 For winery info call 814-236-0910 or 814-236-0913. Once back in downtown Curwensville, follow SR879 E back to Clearfield. Gas: Clearfield, Curwensville, Glen Hope, Coalport, Mahaffey, Bell’s Landing, Grampian. Food: Clearfield, Curwensville, Madera, Glen Hope, Coalport, La Jose, Mahaffey, Bells Landing, Grampian. Emergency Medical Assistance: Clearfield Hospital, 814-765-5341 Calling 911 is recommended to obtain EMS assistance in all other areas. From Exit 111 of I-80, proceed 1.4 M N on SR 153, following signs to SB Elliot State Park. Turn right and make a second fast right to enter the park, or, to visit Panther Rocks go straight on 4-Mile Road after turning. Visitors to Elliott State Park can learn about the history of the Civilian Conservation Corps and its role at Parker Dam and S.B. Elliott State Parks at Elliott’s Welcome Center, housed in one of the CCC constructed buildings. After returning to SR 153, proceed N another 1.7 miles to Hilltop House, a one-of-a-kind gift and craft shop. Parker Dam State Park is 2.7 M ahead. Visitors can picnic, fish, swim, camp, hike or just relax at Parker Dam. After leaving Parker Dam, travel N for 2.5 M. to Penfield. Turn left at the stoplight in Penfield, and travel on SR 255 towards DuBois. Camp Mountain Run, operated by the Bucktail Council of the Boy Scouts of America, will be on the right 1.5 M ahead. Sabula Lake is 5.7 M past Camp Mountain Run. Treasure Lake will be on the right 1.3 M ahead. The public is welcome to visit Treasure Lake’s Silver and Gold Golf Courses, Lake View Lodge, or attend any of the community events held throughout the year. Cabin and condo rentals are also available year-round. Just after Treasure Lake is Exit 101 of I-80, and DuBois Mall after that on the left. Continue approximately 2 miles on SR 255, not turning, to reach DuBois Harley Davidson. It will be on the left. Along the way you will pass Penn State University DuBois Campus. From DuBois Harley Davidson, reverse direction and return on SR 255. Turn right at the 5th stoplight (Shaffer Road). You will pass DuBois Mall again, but on a different side. At the second stoplight, turn left and head toward Rockton/ Clearfield. Once arriving in Rockton, turn left to go toward Clearfield. At approx. 1.4 M there will be room to pull off and take some great pictures of Anderson Creek. Over the Mountain will be a short distance ahead on the right. It’s a great place to stop, grab a bite, and take a break. At the intersection with US 322/ SR 153, turn right if you wish to visit Clearfield. If you liked one of the campgrounds on the earlier part of the drive and plan to spend the night, turn left. A mile ahead brings you back to where you started. Those driving toward Clearfield will see spectacular views off to the right as you come down the mountain into town. Use caution when pulling off and on the highway. To return to SR 879 and I-80, follow US 322 to the first light in Clearfield. Turn left, and travel along the West Branch of the Susquehanna River to the next stoplight. Turn left to return to I-80 and nearby amenities. Emergency Medical Assistance: DuBois Regional Medical Center, 814-371-2200; Clearfield Hospital, 814-765-534. Calling 911 for emergencies in outlying areas is recommended. In the 1933 Governor Gifford Pinchot named mountain laurel Pennsylvania’s State Flower. Its beautiful pink and white flowers attract visitors to the mountains of Pennsylvania each spring. The Backwoods, Backroads, Backwaters is host to many miles of the state flower and we would like to share some of our favorite spots. Don’t forget your camera, although the picturesque memory will be imprinted in your thoughts for an eternity. Laurel Tour #2 From Parker Dam, follow Mud Run Rd, (Parker Dam Rd,) west to intersection with Laurel Ridge Rd, Turn right onto Laurel Ridge Rd. and follow through to Laurel Run Rd. intersection. Turn right onto Laurel Run Rd. and follow to intersection with Harley Dean Rd. Follow Harley Dean Rd. to intersection with Four Mile Rd. Turn left on Four Mile Rd. and follow signs to McGeorge Rd. and south to the town of Goshen. Laurel Tour #3 From Clearfield, follow Rt. 153 North to intersection with Four Mile Rd. Turn right onto Four Mile Rd. and follow to intersection McGeorge Rd. Turn right on McGeorge Rd. and follow it to the town of Goshen. There are many additional places to hike, bike and boat to see the laurel as well. The Visit Clearfield County staff would be more than happy to suggest our favorite places. The month of June is the best time to see the laurel in bloom. It is a great time to see the wildlife offspring as well. The fawn is trying to get a sweet treat, the turkey is spreading its wings and many other creatures are familiarizing themselves with their surroundings.